Several years ago a friend from church told me about this marvelous little book - 84, Charing Cross Road . I put it on my wish list with an intent to read it. Last month at my local book club, another friend mentioned this title and I verbalized the fact that I had long wanted to read it but hadn't gotten around to it yet. The next time I saw my friend she appeared with a gift in hand! It's always special to be given a book that you've wanted to read for a long time - especially by someone who loves to read as much as you do. Not wanting to waste any more time in ignorance of it, I devoured it the next day. 84, Charing Cross Road is an extremely short book written entirely in letters. 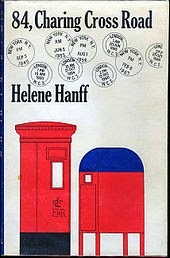 That's right - the entire book is a series of letters and packages which traveled between Helene Hanff of New York and an English bookshop - Marks & Co. - located on Charing Cross Road. Hanff was something of a snobby reader by some estimation and she had a hard time finding books that suited her in America. She was looking for older copies and nicer editions of glorious, beautifully written books! She heard about Marks & Co. and wrote to them to see if they might help her track down particular titles. The letters travel the ocean from 1949 through 1969, during which time so much history was made. It is interesting reading the letters, not just for the love of good books, but also because the world was recovering from war and progressing in any variety of manners. The letters are enlightening, as specifically relates to the state of society post-World War II. Helene was a playwright in New York City and so you also get a feel for the "starving artist" in the big city. "A newspaper man I know, who was stationed in London during the war, says tourists go to England with preconceived notions, so they always find exactly what they go looking for. I told him I'd go looking for the England of English literature, and he said: "Then it's there." I love that! Especially since we're planning a family trip to England in the next year or so and I will be going in search of the England of English literature. I hope I find it! "Have you got De Tocqueville's Journey to America? Somebody borrowed mine and never gave it back. Why is it that people who wouldn't dream of stealing anything else think it's perfectly all right to steal books?" YOU'RE GOING ON A FAMILY TRIP TO ENGLAND?!?!? This sounds like a lovely book. I remember Melissa Wiley recommending it. I read it a few years ago. I think I could stand to reread it! Thanks for the warning about the movie. Why do they think they have to do that??? I've had this on my TBR list for years after seeing a blog friend's review but so far haven't gotten to it yet. Thanks for reminding me! I hate that movies do that to books - as if people won't watch a movie without a romance or can't fathom a platonic male-female relationship. Grrrrr to people stealing books! I'm pretty sure I've seen the movie. It sounds familiar, but I'm positive I haven't read the book. Hmmm... I'll have to remedy that at some point!